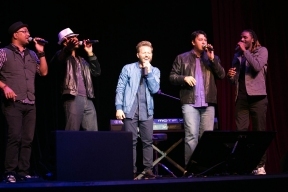 Noel Schajris de Sin Bandera, Undivided Vocal Band, Mariachi Heritage Foundation and the Puerto Rican Arts Alliance Latin Music Ensemble joined together this past Wednesday, May 11, at the Copernicus Center in Chicago for a once in a lifetime concert. The night’s music was a celebration of Latino culture. From Puerto Rican Cuatro strings to Mariachi music to Romantic melodies and sounds of diverse musical styles, this night demonstrated what could be achieved when working together. International and local talent united to raise funds for scholarships that benefit the RMHC®/HACER® scholarship program for Latino students at the local level. All proceeds raised added on to the $123,000 already awarded locally since 2013. Without the support of the McDonald’s Hispanic Owner Operators of Chicagoland area and Northwest Indiana (MHOA) and all the sponsors a special night like this could not have happened.